Working as a Massachusetts Realtor for the past twenty four years one of the more common questions a buyer will ask me is if they should pay points on their loan. My answer always is the same…IT DEPENDS! The reason why you would pay for points on a loan is to get a lower interest rate. A point on a mortgage is equal to 1% of the loan amount. So in simple terms if you are going for a loan of $200,000 one point would be $2000. Paying points may seem like the obvious choice because everyone wants lower monthly mortgage payments. It is not that simple from a cost analysis standpoint though.As a buyer the ultimate deciding factor on whether to pay points or not boils down to how long you plan on staying in the home. Getting a lower interest rate from paying points is a trade off between paying money now versus paying money later. Lets look at an example using the $200,000 loan above. 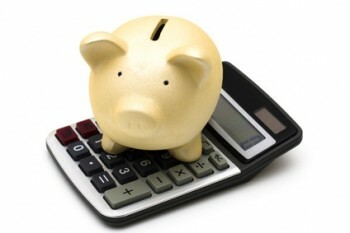 We will assume that the interest rate on a loan with no points will equal 6% and a loan with 2 points will equal 5.5%. By dividing the amount the buyer paid for the points ($4000) by the monthly savings ($56.85) we see that it would take the borrower five years and ten months before they would be at the break even point. If a borrower is going to be in the home for more than five years and 10 months it would make sense for them to pay points. If they are going to be in the home for a shorter period of time the no points option would make more sense. Here is a link to a terrific Loan Points Calculator that can quickly determine if paying points is the better decision or not. 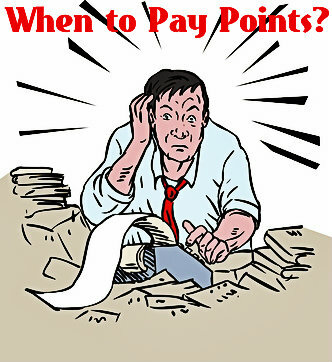 Those that get located fairly often would more than likely be better off opting for a no points loan. When refinancing a mortgage it works the same way. You can either opt to pay points or not. Points are deductible on your income taxes! Another important consideration is that points are fully deductible in the tax year of your closing. This however, only applies to purchases and not when you refinance a property. In the case of a refinance, the IRS requires you to spread out the loan deduction over the course of the loan. Using the $4000 for points in the above example you would be able to deduct 1/30 of $4000 over 30 years. If you happen to pay off the loan early you can deduct the remaining balance in that tax year. In any situation regarding taxes I would always recommend you speak with a tax professional. Remember the guidelines above when considering whether you should pay points on a mortgage loan. Next post In Real Estate When in Doubt Disclose! Previous Article Stop Making Mortgage Payments During a Short Sale? I suggest to my clients if you can sit back and honestly say to yourself that you will own your current home, not do any type of refinancing on that home for the next three years and you can afford to purchase points or origination to lower your Mortgage Interest rate then do it. Also… Does the fact that Mortgage Rates are at all time lows make you want to purchase or not purchase points of origination. I say buy a point that way you have a super all time low rate. Love the post and Site, keep up the good work. Thanks Brian! I hope your mortgage business is going well. Bill, Very nice explanation. Buyer education is huge and you did a real great job explaining the real numbers. I like your to the point explanation. Paying points is something that should be considered carefully, it all depends on how long you plan to stay in the house. This is a timely post as many are probably pondering this as the rates trends upward. Jennifer thanks for your comments on when to pay points on a mortgage. There are times when it makes sense to pay points and other times not so much. Excellent information, Bill. I will be sure to point my clients to this post.